DeSilva+Phillips client, iStrategyLabs, LLC (“ISL”), a full-service digital agency, has been acquired by J.Walter Thomson Company, the WPP-owned global marketing communications agency. ISL provides first class online-plus-offline marketing for brands through four key areas of expertise: social, experiential, design & development and hardware & innovation. Founded in 2007 and led by Peter Corbett, ISL is one of the leading independent full service digital agencies in the U.S., having won Ad Age Small Agency of the Year in 2014 and 2016. ISL has been the face behind unique digital & physical experiences for world’s best known brands, including NBCUniversal, Kroger, and Nickelodeon. ISL is based in Washington, D.C. with an office in New York and employs 80 people. 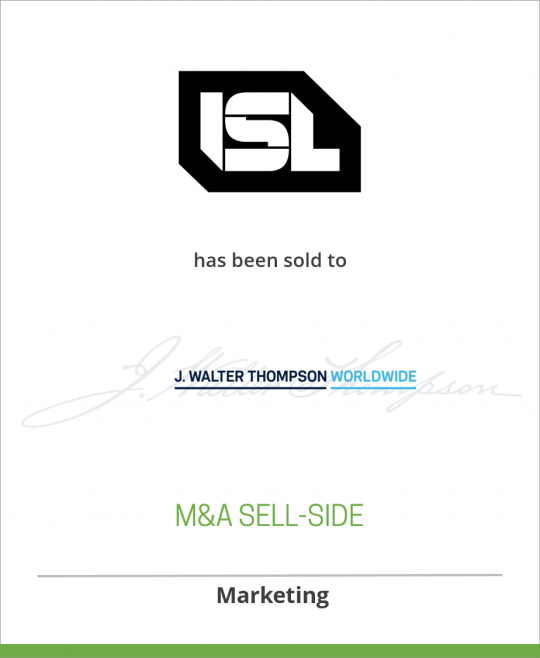 Moving forward, the partnership between ISL and JWT will strengthen the content and innovation focused strategy JWT has led. It will significantly expand its real-time marketing and online-plus-offline content production capabilities; including a fully equipped 20,000 square feet office, multimedia studio and device prototyping workshop space at the ISL Washington D.C location. “We have a dynamic and fast growing business in North America. Our investment in iStrategyLabs is an important next step, and further evidence of our commitment to the market,” said Tamara Ingram, Global CEO, J. Walter Thompson Company. While ISL will continue to be led by CEO, Peter Corbett, independently out of Washington DC, he will also oversee their new office at J. Walter Thompson New York and work closely with the headquarters’ leadership team. This expanded leadership team paired with the combined expertise of the two agencies will offer JWT’s clients and internal stakeholders a broader range of world class content production and innovation capabilities.